Greetings to the followers of the Iowa NAHT blog. There are five news and resource items in today’s post. Each has its own heading and valuable information. As allies and anti-trafficking advocates, we each have a joint responsibility to end this obnoxious crime of modern day slavery once and for all. On Monday, July 30th, 2018 World Day Against Trafficking in Persons focuses on responding to the trafficking of children and young people. 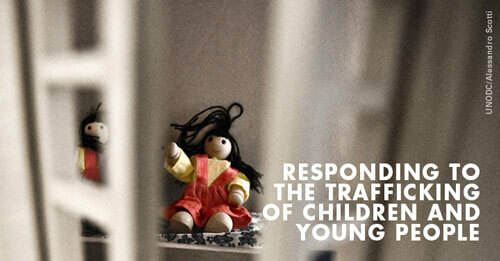 The year’s United Nations campaign highlights the fact that almost a third of trafficking victims are children. Hence, the theme draws attention to the issues faced by trafficked children and to possible action initiatives linked to safeguarding and ensuring justice for child victims. Iowa anti-trafficking coalitions and groups can show solidarity with child victims of human trafficking by holding a public forum or anti-trafficking event. 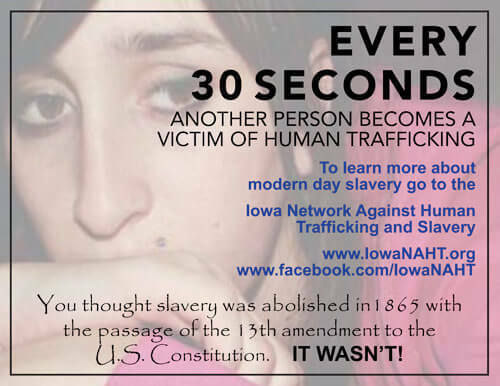 A good example comes from Set Free Dubuque, the Tri-State Coalition Against Human Trafficking, and the Iowa NAHT. Go to this link to see their flyer. For more information, you can email Suzie Wright, Executive Director of Set Free Dubuque. The Iowa Network has an updated informational brochure. 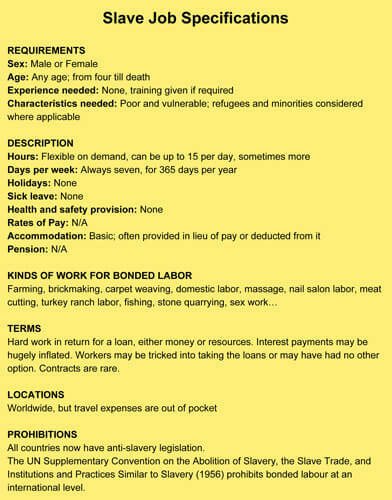 It can be printed off for your use and to distribute to other anti-trafficking advocates. In this fourth version of the Network’s brochure, you will find the name and contact information of the new Coordinator for the Iowa Department of Public Safety’s Office to Combat Human Trafficking, Terry Cowman. Also, there is more information on our two statewide volunteer projects: Hotel/Motel Employee Training and Massage Business Anti-Trafficking City Ordinances. You will also notice more emphasis and information on labor trafficking in the updated brochure. Also, the Network is offering a new 8 x 11 inch anti-slavery poster for you to download and distribute in your church, school, or business. As you know from reading our posts, the Iowa NAHT is placing an increased focus on labor trafficking. This new handout is part of this new Network public awareness effort. This is designed as a one page, 9 x 11 inch handout for allies and advocates to use when speaking to groups. 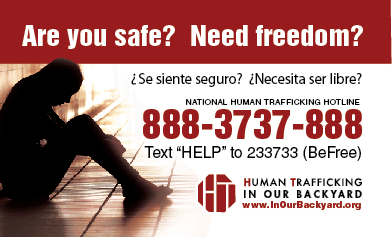 The Stop Human Trafficking poster is useful for posting in convenience stores, truck stops, and other public places where victims of human trafficking can see the toll free 24/7 crisis line and text number. FYI, the Iowa Network is negotiating with the national nonprofit group In Our Backyard to get 15,000 of their small Freedom Stickers. The stickers are designed to be strategically placed in public restrooms stalls, providing victims a safe place to call or text for help. If you or your regional group would be willing to distribute these stickers, please let us know along with the number of stickers you or your group will pledge to distribute. 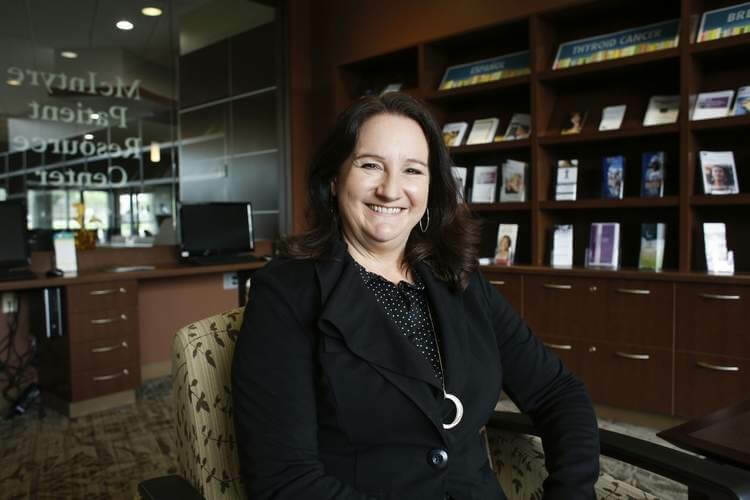 Teresa Davidson is the Mercy Hospital Human Trafficking Coordinator and is a member of the Iowa NAHT Board of Directors. Cedar Rapids could become the ninth city in Iowa to pass a Massage Business Ordinance.